Micaela Marin-Tucker, PA-C, is a skilled and attentive board-certified family medicine physician assistant. 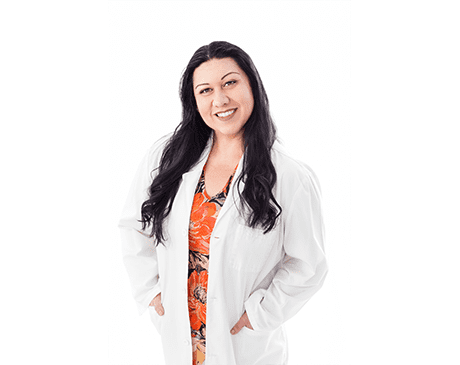 She’s an integral part of the family of caregivers at Valencia Pediatrics, located in the High Desert area, serving patients in Hesperia, Apple Valley, and Victorville, California. Micaela attended Victor Valley College in Victorville, where she completed the certified nursing assistant program and earned her associate degree in math and science. After graduating, she went on to complete the physician assistant certificate program at Western University of Health Sciences in Pomona, California. She has over two decades of experience in treating patients in primary care, as well as specialty disciplines such as orthopedics, gynecology and emergency medicine, and has worked in a variety of settings, from small, private medical offices to large medical centers. Micaela’s skills in both medical treatment and bedside manner are second to none. Her prior work in hospitals, hospice, and residential homes has given her experience working with a wide spectrum of patient needs. She believes in treating patients as a whole, and in maximizing dignity, respect, and honesty. As a strong team player, her energy and abilities maintain the strong flow of a successful medical practice. Micaela is fluent in English and Spanish.